Pipe systems are designed for many uses; however most pipes are engineered to meet specification of load and intent. Like all infrastructure, eventually as it ages, these structures begin to reach the end of their life expectancy. In the past, many attempted techniques for repair or replacement have proven and continue to prove to be costly time consuming, and labor intensive. Luckily improved and less complicated trenchless systems are beginning to usher into the industry as a standard. Epoxytec offers systems which are cost effective, efficient, uncomplicated, and engineered to tackle preventive maintenance and aging pipeline needs for a rejuvenating structural integrity. A Structural Epoxy – In Situ Pipe Lining System by Epoxytec can solve trenchless, structural pipe lining needs where other traditional CIPP methods are limited. This includes culverts, box pipes, elbows, and other pipelines where CIPP is not the best solution. A Structural Epoxy can also be utilized for sectional lining as well as long lengths. Incorporating calculations dependent on the host pipe, semi-deteriorated, or fully structural… Epoxytec can assist you with calculating material thickness requirements based on ASTM F1216 to ensure structural reinforcement. SYSTEM SPECS– Due to the many pipe assumptions and variables, Epoxytec prefers you contact a representative to discuss your pipe rehab and lining needs. Where the structural integrity of your pipe has not been compromised, corrosion prevention liners ensure a proper method to extend the life expectancy of pipeline infrastructure. By applying a barrier coating as a monolithic liner, essentially you are enhancing our interior pipe with a protective coating against corrosion and wear. Not only do you improve the overall maintenance cycle, but you also improve the coefficient of friction (COF), reducing micro-biologically induced corrosion (MIC) build-up / tuberculation, and therefore optimization product output. Using technologies developed by Epoxytec, this can all be applied in situ, as a trenchless technology without any requirement for digging, nor any damage to other surrounding physical infrastructure. 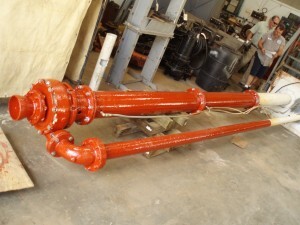 when you participate with in situ (trenchless) technology, the savings and operational downtime benefits are so extensive, that after examining all the areas of cost savings it only makes perfect sense to add a preventative maintenance coating cycle to any design project worth installing or rehabilitating. Have a pipe entering a lift or pumping stations? Coming through a manholes or tank? If this pipe is going to be immersed or in contact with microbial byproducts, gasses, or H2S… protect it prior to service. Protecting both concrete and steel pipes with a high performance coat of urethane-modified-epoxy will extend these workhorse arteries for years of service before corrosion takes control of its life expectancy.